The importance of quarterback depth was proven once again on Saturday when Shane Buechele was forced into action following a shoulder injury to Sam Ehlinger. Lack of depth at the position plagued Texas at the end of the Mack Brown era and through the entire tenure of Charlie Strong. Tom Herman hopes to learn from that misfortune. It started by adding Cameron Rising and Casey Thompson in the 2018 class. Neither has taken a snap and both are heading to redshirt seasons unless Buechele follows Ehlinger to the injured list. Ehlinger has two weeks to get healthy before the Longhorns are back on the field. Texas also holds commitments from Roschon Johnson for the 2019 class and Hudson Card for 2020. Herman and offensive coordinator Tim Beck are done at the position in 2019. That might not be true in the 2020 class. 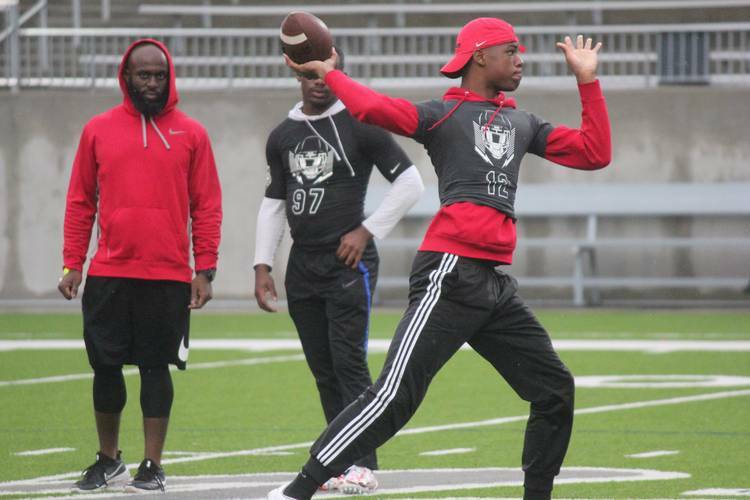 Card is in a mythical battle with Fort Bend Marshall quarterback Malik Hornsby for the title of best dual-threat prospect in the 2020 class. Hornsby holds an offer from Texas and emphasized following his game on Thursday that he remains open despite rumblings of a silent commitment to Texas A&M. Hornsby missed the first half of the season due to eligibility concerns following a transfer. The UIL cleared his move and now Hornsby is 2-0 as a starter for a favorite to win the Class 5A Division I title. The 6-2, 175-pound playmaker is the No. 2-ranked dual-threat quarterback in the country behind USC commit Bryce Young. Card is ranked third. His new head coach is also feeling good about his new quarterback. Alvin product and Texas cornerback commit Marques Caldwell hoped to use his senior season to prove why he belongs in Texas’ 2019 class. The 6-1, 171-pounder is a three-star who ranks as the No. 68-best cornerback in the country and the No. 727nd-best overall player in the class. The long, rangy defensive back can play corner or safety. He’s ranked at No. 50 on the 2019 Fab 55. Caldwell is sidelined with a torn labrum instead of enjoying his senior season and proving critics wrong. He knows the rankings don’t matter, but playing as a senior does to all players in Texas. That’s what makes Friday Night Lights television worthy. It’s a dream most boys in this state work towards in middle school and high school. Caldwell is no different just because his football career will extend beyond Alvin. He’s a football player. And he wants to play football. It’s just not wise. His future includes defensive back in Austin. Caldwell visited for the win over Baylor. He’s committed as a cornerback but he revealed Texas plans to also use him at safety. He’s played both in high school and feels like it will be second nature on a bigger, faster stage. He does prefer cornerback, though.